In this quick guide, we’ll show you how to see your FPS in Frostpunk. So far, I’ve been enjoying the game a lot. I had a feeling I would as I absolutely loved playing This War of Mine. Whilst I havn’t faced any issues myself, some players have been experiencing crashes and high RAM usage. I thought this would be a perfect opportunity to show you how you can add a FPS counter to keep track of your frames. Whilst how many frames per second you are getting doesn’t matter as much in games like this, they’re still an important metric to keep track of. Ideally, you want to be hitting 60 FPS for ultimate smoothness. Under 25 can be unacceptable for some, but it entirely depends what you’re used to. To do this method, we will be using the Steam Overlay feature. I covered a guide similar to this for CSGO. First off, open Steam, and then head to the Settings menu. I’m using the Metro Skin for Steam, so whilst my interface looks different, the steps are the same. The settings menu should be under the menu in the top left corner of Steam. Head to the In-Game tab, and look for FPS Counter. First, choose a position from the drop-down list. I usually go for Top-Left. You have the option to enable High contrast color, which makes the counter neon green against a black background. Press OK to save your changes. The FPS counter will now be enabled for Frostpunk, and any other game that you run through Steam. 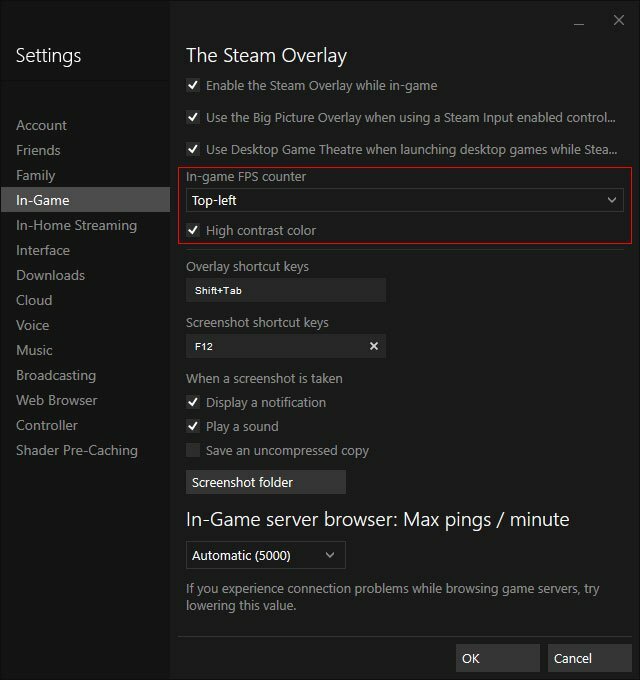 You can also mess with these settings using the Steam Overlay when in-game.